In the long view of July going into the month, a lot of people had circled this weekend on the calendar thanks to a film that was a bit of a long shot to ever happen. Getting the gang back together has had mixed success so far this summer, but this weekend's entry has a better chance than most. 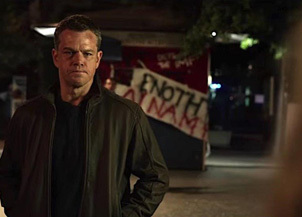 After three main films and a spinoff, it looked like the Bourne franchise was done, thanks to a stated disinterest in continuing it from its lead actor. Indeed, after The Bourne Ultimatum gave us what looked like the neat little bow tie on the franchise we didn't know we wanted, it didn't seem like there was a big reason to continue on with more films. However, director Paul Greengrass, he of the two best films of the series, has returned to it, bringing along Matt Damon for at least one more ride. Unfortunately, the idea behind the film doesn't seem to be much more than “hey, let's make more Bourne films,” and whereas the first three had something to say, the Big Idea behind the eponymously named Jason Bourne is murky at best. Do we really need a fifth run through the Treadstone files, across a series of international locations? Of course there's the counter-point that why not have another awesome action movie in what's amounted to the American James Bond series, all paranoid and brutal hand-to-hand combat.